Going through your own personal struggles can truly help build empathy for better caregiving - and that certainly has been the case with our own director of nursing, Dawn Nimtz. Check out the attached image - a copy of the article about her own fight through cancer and the support and strength she found by joining Team Phoenix is the Milwaukee area. We are so blessed to have Dawn on our team! Pine Haven's Virtual Dementia Tours featured in Press article! Pine Haven Christian Communities is partnering with the Weill Center to offer virtual dementia tours to the public during their special dementia event on March 31. People can sign up to take the tour anytime from 12:30 - 7pm on March 31, 2017. It only takes about 15 minutes to take the tour. At 4pm and 7pm, the Weill Center will be offering special showings of Glenn Campbell I'll Be Me, which is a documentary filmed about his diagnosis with dementia and the music tour that he and his family ran for a year after that diagnosis, to help build awareness for Alzheimer's disease. To read the online version of the Sheboygan Press article about these events click here. To read the official Weill Center blog, purchase tickets, or sign up for the tour, click here. Perfect moving weather welcomed residents as they moved into their new home at Pine Haven Christian Communities’ Haven Drive campus in north Sheboygan Falls on August 3rd. 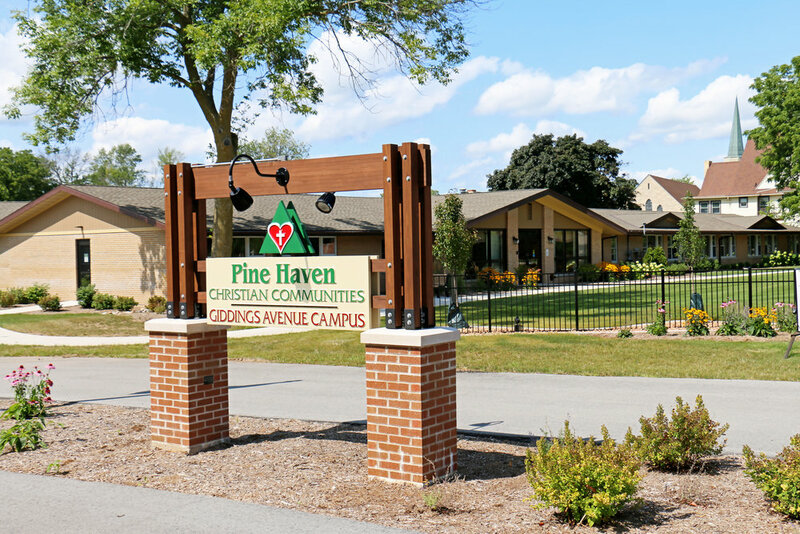 Thirty-one residents moved into the new portion of the campus, coming from the community as well as moves from Pine Haven’s Pine Drive campus in Oostburg, their Giddings Avenue campus in Sheboygan Falls, and within the Haven Drive campus itself. Staff, family, and volunteers worked together to make the move a smooth and easy process with little disruption to the residents. Most of the moves started after breakfast and were complete in time for the residents to have lunch in their new home. The new section of the Haven Drive campus includes 8 traditional assisted living apartments, 24 apartments for later stage memory care, and 8 apartments for those who need both memory care and high levels of physical care – the only assisted living household of its kind in Sheboygan County. Portions of the campus previously opened include: 40 apartments for supported independent living, 36 apartments for long-term skilled nursing care residents, 14 apartments for rehabilitative therapy patients, a state-of-the-art therapy gym providing both in-patient and out-patient rehabilitation services. 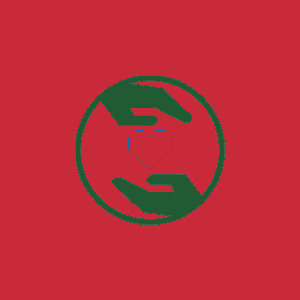 It is a full continuum of care. The campus also includes many community features such as a multi-purpose community center for community events, an educational center, and a Village Square with a café, general store, beauty salon, and room for people to gather and socialize. Built at-grade, so those with walkers or wheelchairs will have access to all features, Pine Haven’s Haven Drive campus is set up like a neighborhood, to feel like a community anyone would want to call home. News of the move was featured in the Sheboygan Press in their article, "Pine Haven’s Haven Drive campus open in Sheboygan Falls." 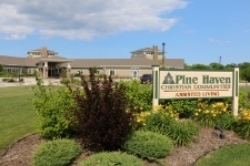 Pine Haven Christian Communities' Giddings Avenue campus will undergo remodeling after residents of the nursing home move into the new Haven Drive campus in north Sheboygan Falls. On May 6, 2015, the Falls News reported that the Sheboygan Falls planning commission approved the plans for the renovations at Giddings Avenue campus, as front page news. We'll post more on the plans for these renovations soon! Each year, Pine Haven gives back by hosting a Children's Community Christmas event. This year's event was featured in a letter to the editor of the Sheboygan Press. You can see photos of the event, along with other holiday events at Pine Haven Christian Communities, on our facebook page in our Christmas 2014 photo album. Milwaukee Biz Times recently highlighted the changes Pine Haven Christian Communities have made to improve the lives of their residents - by hiring new Life Enrichment Manager, Martina Wessels, and Chef, Crystal Thomas. Pine Haven Christian Communities has recently added two new staff positions: Pine Haven Chef, Crystal Thomas, and Pine Haven Resident Wellness Manager, Martina Wessels. The organization purchased and installed new, state-of-the-art technology in dietary food preparation including a “combi-oven” and a “blast chiller” over the summer. This equipment, which is new to the long term care industry, allows Pine Haven staff to provide fresher and healthier food, while increasing the variety of options. In order to make the most of the new equipment and further enhance dining service, Pine Haven hired Crystal Thomas as their new chef. Crystal has a degree in culinary arts, baking, and pastry arts & science from Johnson and Wales University, as well as a certificate in education and supervised culinary interns. She has over 18 years experience as a chef in a variety of settings, including restaurants, resorts, and country clubs. Locally, she has worked at The Osthoff Resort, Lake Street Café, and The Gear Box. Crystal spent 10 years in the United Kingdom working at a resort with a castle and hotel, where they transitioned from traditional cooking equipment to the same food preparation method Pine Haven will now be using. Looking to enhance the daily lives of residents, Pine Haven also hired a new Resident Wellness manager, Martina Wessels, in early September. Martina Wessels earned her bachelor’s degree in exercise science from Trinity Christian College in Palos Heights, Illinois. Since graduating, Martina worked for Alliance Rehab at a retirement community similar to Pine Haven providing fitness services to residents in independent living, assisted living, skilled nursing, rehabilitation and dementia care environments. Martina has created exercise programs, coordinated activities within a resident fitness center, planned and coordinated games and fitness activities, created displays on health topics and presented seminars on fitness and wellness topics. Martina has already structured a new “Gym to Go” program, where she works with individual residents to assess their condition, set goals, and conduct a personalized workout routine with them on a regular basis. This is the first of the new initiatives Martina will be developing to help improve the overall wellness of all Pine Haven residents. Residents are pleased with the changes. Compliments from residents about the food began as soon as the new equipment was being used, and continue to come in as residents enjoy the new and tasty creations. And many people have already signed up for the newly launched “Gym to Go” program. For more information about Pine Haven visit www.pinehaven.org or call 920-467-2401. Pine Haven Christian Communities nursing home, located on Giddings Avenue in Sheboygan Falls, has earned the Five-Star Overall Rating from the Centers for Medicare and Medicaid Services (CMS), as well as a Five-Star Rating for Staffing and Quality. Five Stars signifies a “much above average” rating, and is the highest ranking a nursing home can achieve. The Five-Star overall rating is made up of three areas, state surveys or health inspections, staffing levels and quality measures. CMS reviews nursing homes regularly and updates rankings on the official US Government Site for Medicare, http://www.medicare.gov. Homes are reviewed and ranked for four criteria: State survey results, staffing levels, quality measures, and overall. State health inspection surveys are ranked on a three year running total. Staffing is measured on the ratio of residents to staff. Quality is ranked based on how well the home cares for residents’ needs. Pine Haven has regularly been recognized throughout Sheboygan County for their Christ-centered, quality care, since they opened in 1950. They have been named the best nursing home and best assisted living in the Sheboygan Press Best of Sheboygan County Readers’ Choice for the past two years running (2012 and 2013 poll).